Success does not equal happiness; happiness equals success. At least that’s the basic premise of Achor’s positive psychology book THE HAPPINESS ADVANTAGE. In case you’re wondering, “What’s positive psychology?”, it’s a branch of psychology that focuses less on curing depression and more on fostering happiness for everyone. 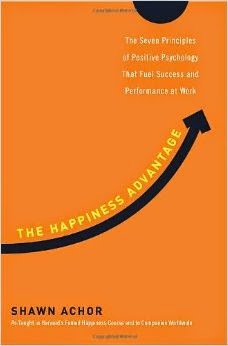 To elaborate on this book’s proposal, Achor suggests that many people work hard - to the detriment of their well being - because they believe earning enough promotions and raises will eventually earn them happiness. To the contrary, Achor believes that if we cultivate happiness our productivity and success at work will increase and naturally lead to said promotions and raises. With many psychology books, I feel I already intuitively picked up on trends the author describes, but it’s nevertheless validating to read my perceptions clearly stated and backed up with studies and specific numbers. As one example, I have already noticed that both for myself and many other people it often takes multiple positive experiences to outweigh a negative one. Studies have demonstrated the truth of this observation. In fact, detailed research has led to some specific ratios. (I’ll round to whole numbers here.) In the workplace, it takes 3 positive interactions with your superior to outweigh 1 negative. So for every single reprimand, scolding, criticism, or passive aggressive remark you need 3 compliments, accolades, rewards, or recognitions to break even. Note the 3:1 ratio doesn’t put you in an above average mood; 3:1 puts you at average while anything fewer than 3 positive to 1 negative will put you at below average. Further research has actually found that the best ratio for workplace productivity is 6:1. So in work environments where people have 6 positive experiences for each negative one, their productivity is at its peak. Achor breaks down “The Happiness Advantage” into seven principles. So instead of remembering the plethora of relevant research and tips from this book, you only need to remember seven trigger phrases. I’m particularly interested in The Zorro Circle and Social Investment. I’ve recognized before that I could benefit from concepts like The Zorro Circle and yet I find them very difficult to move from theory to practice. The Zorro Circle refers to the legendary figure Zorro - who did not become a mater of the sword overnight. He was clumsy and impatient initially until his mentor drew a circle in the dirt and declared that Zorro must become master of this small space before he could step farther. In his work as a consultant, Achor frequently applies this technique to overwhelmed professionals. Take, for example, the executive who took Achor aside and confessed that while he had been preoccupied with a project that took all his attention he entirely neglected his email and now had over 1,000 messages demanding his attention. The thought of answering all 1,000 emails as quickly as possible was overwhelming at best, incapacitating at worst. So instead Achor suggested a Zorro circle. First the executive would focus only on responding to new emails for a few days. Only once he felt fully in control of keeping up with his current flow of incoming mail could he look back at the old emails. Achor suggested that each day the executive could tackle one more day’s worth of old emails, never spending more than an hour on this task per day. Within 3 weeks, the executive had successfully cleared his email - and all by taking little but consistent steps. I struggle with this and have recognized that multiple times before I ever picked up this book. I’m an ambitious, motivated person with lots of personal goals for myself from exercising every to day to training my cat to learning Japanese and eventually other languages to writing and reading as much as possible. When I look at everything I want to accomplish, I can feel hopeless because it seems like too much. Yet I have found that when I commit myself to miniscule steps every single day they add up much faster than when I only wait until I have a good chunk of time to dedicate to a particular task. As for Social Investment, I fall into the logical fallacy of pushing people away when I need them most. Or I did. I have vastly improved on this score over the years and found myself surprised at the difference. In the chapter on Social Investment, Achor discusses how surrounding ourselves with supportive friends can lessen any struggle. Yet many of us have the reverse instinct to pull away from others when we’re sad: cancelling plans with friends after a bad day at work or ignoring phone calls from family because you only have bad news. In both these examples, a social activity with a friend or phone call with a family member could boost your mood, even pull you completely out of whatever helplessness you’re feeling and suddenly make your current problem seem smaller or at least more manageable. I used to be a case study in withdrawing from social interaction when something bothered me. In recent years, I have made an active effort to call friends or make plans when I’m I a bad mood and have been pleasantly surprised to see how - rather than my bad mood affecting the social activity for the worse - the social activity almost always improves my mood. Though THE HAPPINESS ADVANTAGE is written specifically with the workplace in mind, much of the tips carry over into other aspects of life. The only caution I would make is that obvious doesn’t mean easy. Achor shares several stories of people who scoff at his tips as ridiculously obvious and yet he notices that they still don’t put those obvious tips to action. It’s not enough to know what to do; go do it.